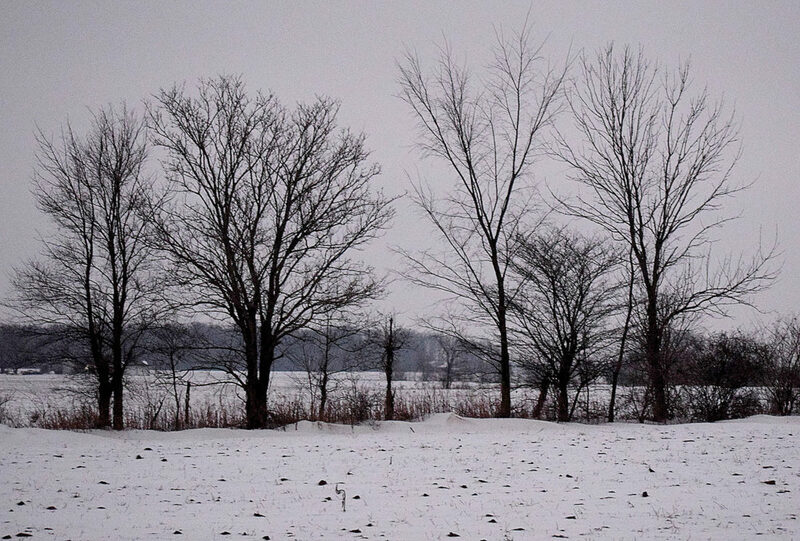 PHOTO BY JILL GOSCHE Snow covers fields near US 224 and SR 587 Monday evening. Winter weather resulted in slippery Seneca County roads Monday. Seneca County Sheriff’s Office placed the county under a Level 1 snow emergency and then a Level 2 snow emergency Monday. The level decreased, and the snow emergency was canceled about 7:30 p.m.
National Weather Service issued a winter weather advisory from midnight Sunday until 1 p.m. Monday. In Fostoria, a car slid into a ditch at North Main Street and West Jones Road Sunday evening. At 3:45 a.m. Monday, a man reported to Seneca County Sheriff’s Office that he was stuck on ice on a hill on CR 38, and about an hour later, a person reported a tanker needed pulled back onto the road at East CR 34 and North TR 169. About 7:30 a.m., Ohio Department of Transportation advised Seneca County Sheriff’s Office there was a disabled vehicle at West US 224 and South SR 53. The vehicle had struck a tree on SR 53 in Wyandot County, and the man drove it until it ran out of antifreeze, a report states. At 9:21 a.m., Tiffin Police Department notified Seneca County Sheriff’s Office it had received a call about a car in a ditch near North SR 53 and West TR 118. The temperature was a few degrees above freezing Monday night. National Weather Service’s forecast called for a chance of freezing rain Wednesday and snow and sleet Friday night.